Lensman turned-film maker P.C.Sreeram took time off from his hectic schedule to talk about his ongoing projects and upcoming movies. He is excited, like all movie buffs are, about the most keenly anticipated movie of the season, Ai. He is not supposed to reveal much, but he does let drop that Vikram's look is likely to be the film's trump card. 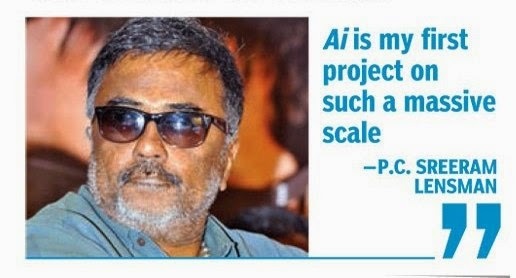 "Ai is a commercial entertainer through and through," says Sreeram, and this is the first time I'm associating with a movie which has been shot on such a massive scale. it has four amazingly chroreographed fights, one of them improvised by the fight master of Crouching Tiger Hidden Dragon, which is sure to be of international standard. Vikram has delivered his best; he is born to act. His performance and makeover are likely to be discussed widely." Terming Amy Jackson as the 'ultimate beauty' Sreeram says no one else would have suited the role she essayed, despite being signed on for the movie at the last minute. 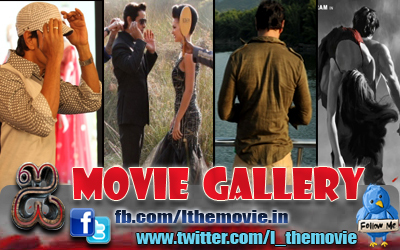 He is also all praise for Mollywood actor Surest Gopi, who plays a prominent role in Ai, for pushing the boundaries. However, he is not going to be able to attend the film's audio launch as the date clashes with work to be done for Shamitabh.